A fast-growing Asian perennial aquatic plant, hydrilla has spread across North Carolina — costing millions of dollars in control efforts. Because the state recognizes Hydrilla verticillata as a noxious aquatic weed, it is illegal to import, culture, transport and/or sell it here. Federal regulations ban importation to the country as a whole. During crabbing season, Laura Eure and Marvin Godd normally check about 300 of their pots a day in the Albermarle sound near Edenton. In recent years, dense submerged plant growth has made it increasingly difficult for them to navigate the canal that runs from their dock to the sound. “We went out every day” and so could keep a small lane open, Eure explains. But neighbors farther up the canal were not so lucky last summer — nor were some of the waterfowl that got stuck in the matted plants when looking for food. In July 2010, Rob Emens of the state’s Aquatic Weed Control Program told Goff and Eure that the mat of plants was invasive hydrilla. Native aquatic plants, including duckweed, play important roles in coastal habitat, including offering cover and food in nursery areas for many fish and shellfish. In fact, submerged aquatic vegetation — or SAV — is one of six key habitats outlined in the N.C. Coastal Habitat Protection Plan (CHPP). In addition to providing fish habitat, submerged plants stabilize sediments, improve water clarity, remove excess nutrients and carbon dioxide from the water, and release oxygen. Thus, commercial and recreational fishers, paddlers, and state and local authorities, have encouraged native species in coastal waters over the years. Hydrilla has invaded North Carolina’s freshwater lakes for decades. It can survive in salinity levels of up to five parts-per-thousand, often a long way into Albemarle Sound. “It is a complex situation. Many of the available options are not good fits for this ecosystem,” notes Rob Richardson, a North Carolina State University scientist who handles research and extension efforts on hydrilla. The invasive plant’s arrival in Albemarle Sound and its tributaries is a very different challenge, leading to a regional meeting in December that drew nearly 100 folks from local, state and federal agencies, including North Carolina Sea Grant. Barbara Doll participated in the December meeting with her focus on outreach aimed at creating a network of informed boat owners who can identify the plant, provide early warning of new infestations and help prevent further spread of this invasive plant. Hydrilla spreads through rhizomes or runners, with from two to eight new branches forming at each intemode. Individual stems, up to 20 feet long, grow horizontally when they reach the surface, creating the mat effect. Warming spring temperatures cue a growth cycle by stimulating the sprouting of turions, some of which are loose and distributed by water movement while others lay in the hydro-soil. First identified in Wake County around 1980, hydrilla initially may have been dumped from a home aquarium into lakes in Umstead State Park. It then spread to nearby lakes, likely as a hitchhiker on boats or trailers, or possibly transported via waterfowl. Lake Gaston was one of the first large reservoirs in North Carolina to become infested with hydrilla. Since the mid-1980s a cooperative effort has involved federal, state, and local government agencies working to manage hydrilla growing within the lake. Millions of dollars have been spent on herbicides, and thousands of sterile grass carp known as triploids have been released as part of the ongoing hydrilla management there. Emens has been working on hydrilla Issues in the Chowan River since 2009, where, he says, “it started to appear in some of the small canals and boat basins adjacent to the river near Rockyhock.” This is likely a new infestation because there are no earlier records of hydrilla being found in the Chowan River Basin or the Albemarle Sound. Over the years, targeted chemical and biological control measures have been tried in lakes and rivers, with varying success. In some lakes in the piedmont and mountains, non-native sterile grass carp have been added to eat the hydrilla. But grass carp require a special state permit due to potential harm to native plant and fish species. Resource managers are not expected to seek permits in the coastal plain. “SAV is critical to commercial and recreational fisheries. Grass carp will not be an option,” Emens says. Also, some herbicides may work in private man-made lakes, but the chemicals are not approved for use in estuaries. Physical removal has potential, but can be tricky. “Harvesting can create fragments that can drift into a new area and start another colony,” he adds. Ultimately, eradication in the Albemarle Sound may not be possible. The timing of hydrilla’s arrival in Albemarle Sound comes just as the state has been pleased with return of native SAV into the sound in the past five years, explains Anne Deaton of the N.C. Division of Marine Fisheries, who works on the state CHPP. The dense mats can cause multiple problems, from limiting light in the water column to encouraging hypoxia as large amounts of plant matter decay, which consumes oxygen. Heavy infestation in deeper waters also could get in the way of traditional fishing areas, Deaton says. Prevention is key, Richardson adds. “Clean your boat and trailer. 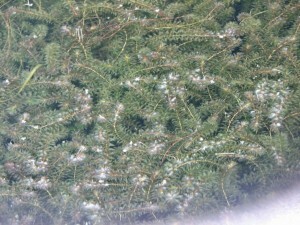 Remember there are lots of edges” that can snag small plant pieces. Emens treated the hydrilla in the canal with aquatic herbicide in September 2010. The thick mats of hydrilla choking the canal required multiple treatments over a one-month period. The weed crowds out native species. Photo by Rob Emens. Because hydrilla in the sound has concentrated along the shoreline, it has not yet caused problems with the couple’s crab pots. Rather, the problem has been “getting to our gear — our livelihood,” Eure notes. However, the hydrilla’s shoreline location may cause problems for the crabs that often move into the native SAV near the shoreline when molting. “They are protected from the rockfish and other predators,” she explains. But crabbers fear that the hydrilla mats could become so dense that the crabs will get in, but not back out again. Eure and Goff are among residents working with state, local and federal officials to stop the spread of hydrilla in the Albemarle Sound. A kayaker, she had noticed hydrilla about the same time she heard from the county’s Soil Conservation District and Cooperative Extension staff members. Knighton learned more when she joined Emens for an inspection tour of the creeks leading into Edenton Bay. “I am pretty good at identifying it now,” she says. “We’ve got to prevent what we’ve got in the creeks from doing real damage,” she adds. The town council has requested to join the state’s hydrilla work plan on a cost-share basis. In the meantime, outreach is the key control component. Knighton was pleased with the reaction when she started contacting local marinas to ask them to distribute brochures about cleaning boats and identifying hydrilla — efforts to reduce the plant’s spread. 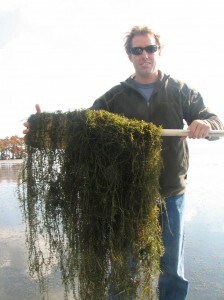 Think you may have seen hydrilla in coastal waters? Hydrilla Hunt cards provide information to help you identify potential sightings, along with information on where to send specimens to be confirmed. Or you can take the sample to your county N.C. Cooperative Extension office. To download the card, go to: www.ncwater.org and follow the Aquatic Weed Control link in the middle of the page. In the meantime, remember to clean your boat and trailer thoroughly each time it moves out of a body of water. This article was published in the Winter 2011 issue of Coastwatch.